In the UK, umbrella etiquette is essential. Holding, closing, carrying, and shaking off your brolly is an art form if you want to avoid poking fellow pedestrians in the eye or showering them in rain when you step into a room. Of course, this becomes even more difficult in busy public places. At this time of year, town and city centres are filling up with the twinkling lights, decorated stalls and festive food carts of Christmas markets, which have rocketed in popularity in the past few years. If you’re planning on visiting one this year, you can expect two things: typical British winter weather and the need for nimble umbrella etiquette. To help, Fulton Umbrellas — a UK supplier of birdcage umbrellas and rainwear — has revealed its top tips for safely using your trusty brolly in a bustling Christmas market. Don’t make it more difficult for yourself by trying to navigate a huge golf umbrella around a little village market. The course is the best place for these and taking them anywhere busy is likely to irritate passersby. What you need for the best control of your brolly is a walking umbrella that’s large enough to keep you dry but nimble enough to dodge other market-goers. How are you planning on getting to the Christmas market? If you fancy a few mulled wines and are taking public transport, never place your soaking umbrella on the seat next to you. This is a highway to a telling off or, at best, tuts and grumbles from your fellow passengers. Instead, shake off your umbrella outside and put it on the floor at your feet. If it’s still wet, put its cover on or use a plastic bag to make sure you don’t create a slipping hazard. Once you’ve mastered the umbrella dance, weaving your way around a rainy Christmas market will be a breeze. Basically, the umbrella dance involves lifting and lowering your umbrella in sync with the heights of your fellow market revellers — raising it to allow shorter pedestrians to pass by unharmed and lowering or tilting it away from taller people. For decent umbrella etiquette in a busy Christmas market, you need to have good awareness and excellent timing. Remember: as the holder of the umbrella, you’re in charge of avoiding clashes. It’s Christmas, so treating yourself is necessary. Avoid flimsy, cheap brollies — that’s the last thing you need on a windy, rainy Yuletide evening — and opt for a sturdy design, instead. 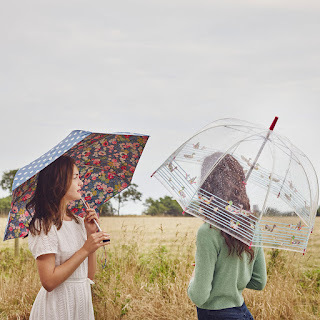 Keep an eye out for umbrellas made from fibreglass, as these are especially strong and comfortably lightweight, which is ideal if you’re spending hours looking around stalls and buying gifts. You can even get designs featuring automatic openings, so you don’t have to fiddle around in the middle of a shopping crowd to open your umbrella quickly in a shower. Accidents happen and almost everyone you might catch with your umbrella will tell you it’s fine and merrily carry on. However, if you poke a bystander in the forehead because you were too busy texting on your phone to notice them, they might not be as forgiving. If you need to take a call or answer a message, stand at the side or between the festive stalls to make sure you’re safely out of the way and don’t bump into anyone. Putting up and closing your umbrella is another crucial part of umbrella etiquette — and can make all the difference between causing fury or damage and having an incident-less evening. Many Christmas markets have a mix of shops, cafes and stalls, so chances are you’ll head inside to look around or enjoy a hot drink at some point. As superstition and manners dictate, when you step inside, it’s time to put the umbrella down. Before you do this, shake off as much water as you can outside, avoiding any passersby, and (if possible) leave it at the entrance or put it into a plastic bag so you don’t wet the floor and cause anyone to slip. How about if the rain has simply stopped? If it was just a short shower, step to the side of the walkway or path to close your umbrella. Never suddenly stop in a walking crowd, as someone behind you could walk straight into your umbrella spoke. As for opening your brolly, all you have to do is make sure there’s nobody within touching distance, either in front or behind you. Good umbrella etiquette on snowy strolls around Christmas markets isn’t just about dodging mishaps, it’s also about sharing. If you’re with your partner, child or best friend; place your brolly between you both while you’re walking. Not only will this reduce the chance of hitting a stranger, but it’ll also create the right cosy, cheery atmosphere to enjoy your festive outing. If you or the person you’re with are big on Christmas, it’s likely that you’ll be stopping at nearly every stall on your way around the Christmas market. When you’re getting free gingerbread tasters and browsing the glass tree ornaments, it’s easy to lose the optimum umbrella stance. Rest it over your shoulder — this only takes up space, which means less walking room for people behind you. Let it dangle (canopy open and facing the floor), just because you happen to be under an awning or roof. Hold it horizontally under your arm. Spin it between your fingers at your side — Christmas markets are full of kids, so you have a good chance of catching one of them at this height. If the rain has stopped and you’re carrying your brolly closed, make sure you hold it vertically with the pointed end closest to the floor. Bear these tips in mind to refine your umbrella etiquette and avoid having to apologise for yourself at this year’s Christmas markets.